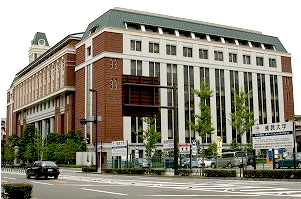 Kinugasa Campus is accessible by taxi, train, and bus or a combination of the three. Refer to the access map below for more instructions. 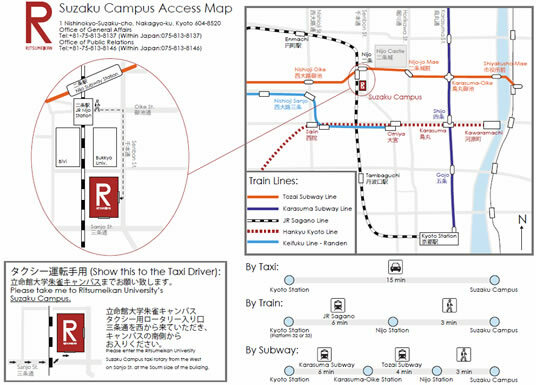 If you use a taxi from Kyoto Station, it takes 15 minutes to get to Suzaku Campus. which departs from Platform 32 or 33. You take this line to Nijo Station, the second station from Kyoto Station. If you use the subway from Kyoto Station, take the Karasuma Subway Line. On arriving at Karasuma-Oike Station, transfer to the Tozai Subway Line. The second station from Karasuma-Oike Station is Nijo Station. After getting off the train at Nijo Station, you can walk 3 minutes to　Suzaku Campus.